Well, we finally did it. 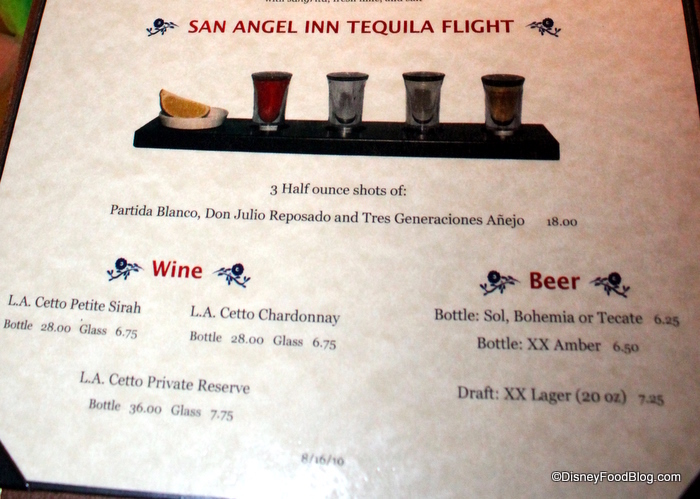 After dreading a trip back to Epcot’s San Angel Inn in the Mexico pavilion due to a couple of bad meals there, we booked an ADR. It was more a “we have to go because I write a food blog” thing than an avid desire to give the restaurant another chance, but…as it turns out…we’d been missing out for far too long. 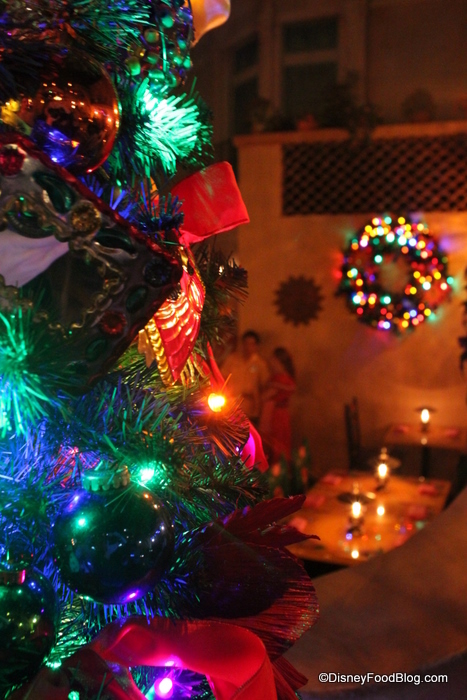 Atmosphere has always been the main selling feature of San Angel Inn. Located inside the Epcot Mexico pyramid with seating along the Gran Fiesta Tour river, this restaurant offers a fun ambiance that you just won’t get anywhere else (besides Blue Bayou in Disneyland, maybe!). Because the Mexico Pavilion’s pyramid is home to the set-up of a Mexican village in the evening, the restaurant is in a perpetual state of twilight. This gives it a romantic atmosphere even when the rest of Epcot is flooded in sunlight. And we were there during the holidays, which added to the warm, welcoming atmosphere. 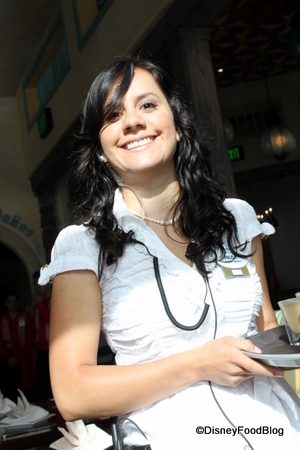 It’s one of those theme restaurants that concept developers dream of — it’s able to offer guests the opportunity “dine in a story” without being too “kitschy” (as some complain is the case at places like T-Rex Cafe and Rainforest Cafe). 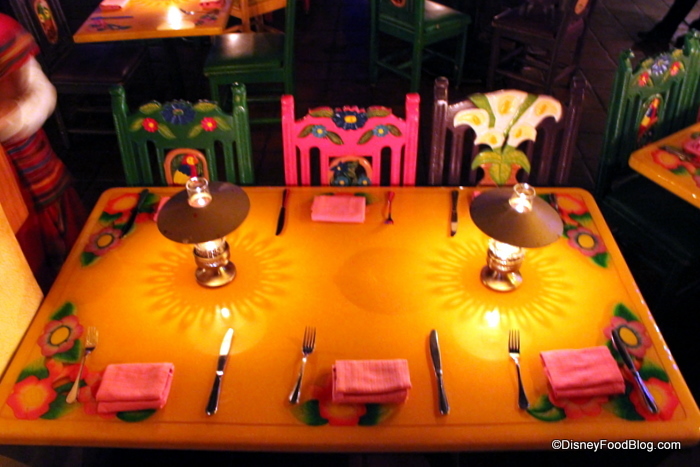 Guests are served at big, chunky, colorful wooden tables and seated in beautifully painted chairs. The building facades located on three sides of the restaurant add to the outdoor village feeling. Now, while I don’t advocate waiting forever for a river-side table here at San Angel Inn (like I do at Blue Bayou), it IS fun to sit by the water. There’s no harm in requesting it when you check in for your reservation. 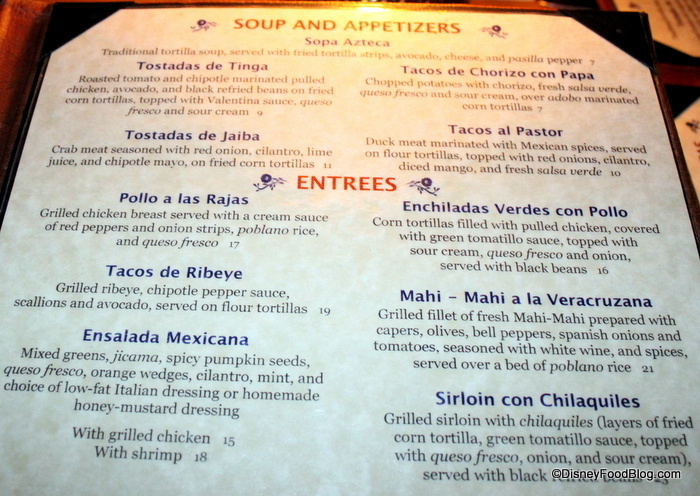 While guest favorites remain, the menu at San Angel Inn has undergone an overhaul — and is probably still going through one (the posted menus were different from the menu we received at the table!). Like the rest of the Mexican Restaurants on property run by San Angel Inn, LLC (i.e. just about all of them), margaritas are now the star draw on the menu. 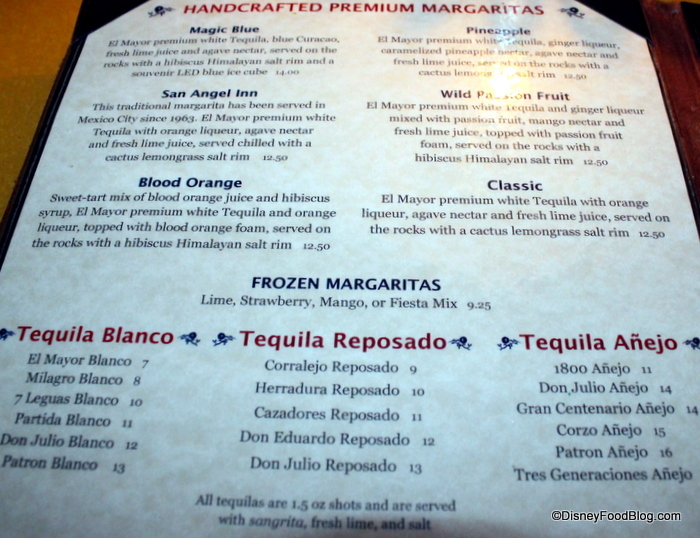 They’ll still bring you the old frozen lime, strawberry, mango, and fiesta versions, but having experienced those many times, let me suggest you go with the versions similar to what you’ll find at La Cava del Tequila, Maya Grill, and La Hacienda de San Angel. I’d recommend any of the six “new” margaritas, but I happened to choose the Blood Orange on this trip. 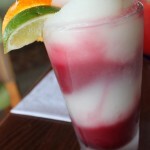 I wanted to compare it to the Blood Orange margarita I’d recently ordered at Flying Fish Cafe. While I think I like Flying Fish’s version better, this was certainly no slouch. I have never and will never understand the appeal of adding “foam” to anything (unless you consider spray whipped cream or spray cheese to be “foam”), though, so it didn’t really add to the experience for me. Still, the margarita was powerful and tasted great, which is all I ask from a margarita. The chips and salsa were delivered next, and were complimentary. On our last visit, the chips happened to be Tostitos, which my Texan husband found galling. I told him they’d probably just run out of their regular chips, but I’m not sure he ever got over being served Tostitos in an “authentic Mexican restaurant.” Happily, these were not Tostitos. 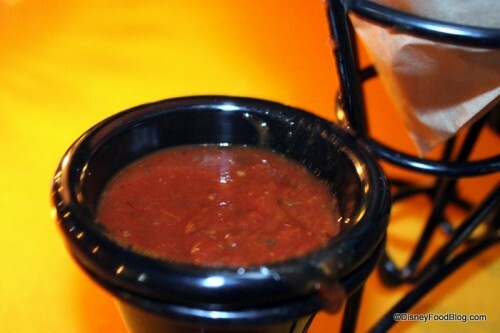 And, funnily enough, our server warned us that the salsa might be hotter than what we were used to in the States. We told him we were from Texas and Buffalo respectively, and that we were conditioned to enjoy spicy sauces. Sure enough, this was closer to ketchup than anything you’d be served in Texas 😉 Still, it passed muster for my husband, who’s the connoisseur of salsa in our house. The appetizer menu was a happy surprise. My husband and I have come to understand that at Disney World’s Mexican Restaurants, you focus on margaritas and appetizers because those are the best parts of the menu; we were understandably nervous that the apps wouldn’t live up here. No need. We ordered Tostadas de Tinga and were very pleased. 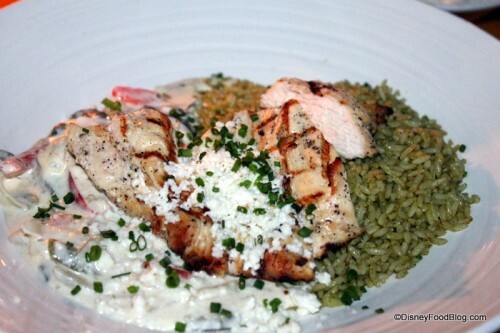 They were fresh and flavorful, and we loved the queso fresco. My husband loved these so much he said he’d gladly order two orders for his entree next trip. Speaking of queso fresco — down here where we live, ordering “queso” in a restaurant will usually get you melted cheese; however ordering extra queso fresco at San Angel Inn got me a bowl of white cheese crumbles like you see on the top of the Tostadas de Tinga! 🙂 Live and learn… no “queso” as we know it at San Angel Inn, sadly. On to the entrees! I knew before I even arrived at the restaurant what I was going to order: the Pollo a las Rajas was the redeeming factor for me on the last trip to San Angel Inn, and I couldn’t wait to order it again. While the recipe has changed slightly, it’s still a great dish, and is perfect for folks who might not be 100% into Mexican food, yet. Basically, it’s chicken, cream, peppers, onions, cheese, and rice — you can’t really go wrong, and I enjoyed it much more than the entree I had at La Hacienda de San Angel. What can I say — a little cream sauce goes a long way for THIS girl! However, I didn’t eat much of the rice since it had such a strong cilantro flavor (which, as you know, is a spice I cannot tolerate in high doses — blech!). 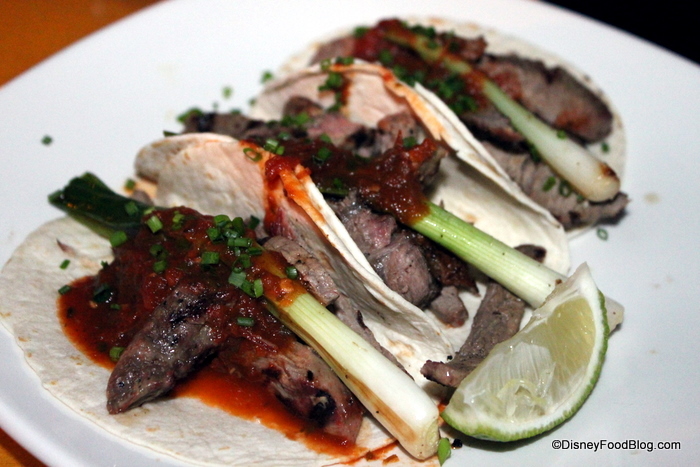 We also ordered the Tacos de Rib Eye — again, a very picky-eater-friendly dish. With steak, avocado, pepper sauce, and scallions, there’s not much to dislike. The steak was perfect (surprisingly NOT overcooked! ), and tasted great with the additional flavors. Nothing was overwhelming in this dish, either; flavors blended very well. 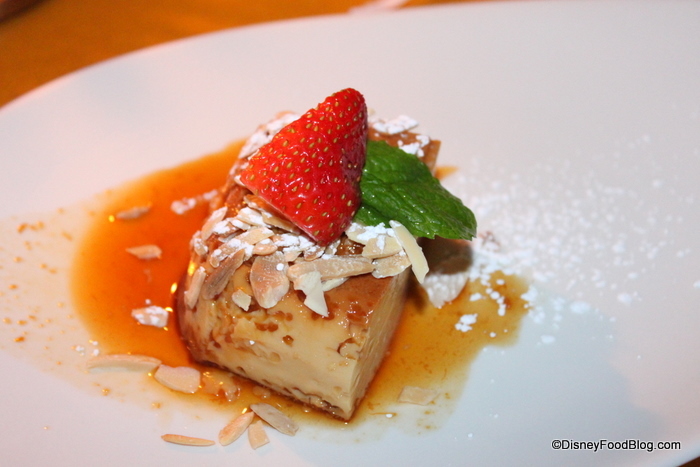 Now, we know from experience that many San Angel Inn, LLC, restaurant desserts are overpriced and pretty bad, but we ordered some anyway — for research purposes! 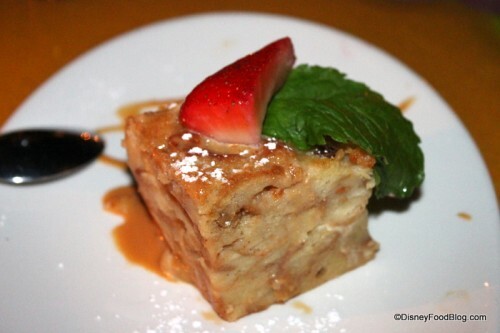 It was flan and white chocolate bread pudding for us this time, and, really, we should have skipped it. Neither of us really love flan, and we ordered it hoping we’d change our minds. We didn’t. And the portion was too small (that’s NOT a big strawberry, so you can deduce how tiny the flan portion was) to cost $6.50. The white chocolate bread pudding would have been much, much better if the caramel serving had been quadrupled. 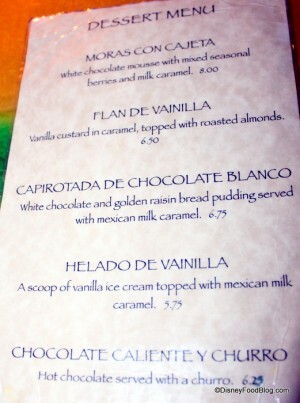 We loved the caramel and will choose the ice cream with caramel sauce, hands down, on our next visit. But we’ll ask for extra caramel. No matter what. Heck, we might even just go up to the podium and get a bucket of caramel sauce to go. 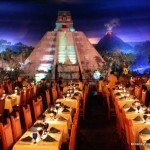 For years, I considered San Angel Inn an atmosphere-only restaurant. During my previous experiences, the food hadn’t been stellar, and the service had been even less so. However, this trip really changed my mind. I have a feeling that some management changes (yay, Hilda!) and some improved menu development and service strategies have paid off. While the food still isn’t the best I’ve had on property, I will certainly be happy to head back to San Angel Inn when I have the chance! 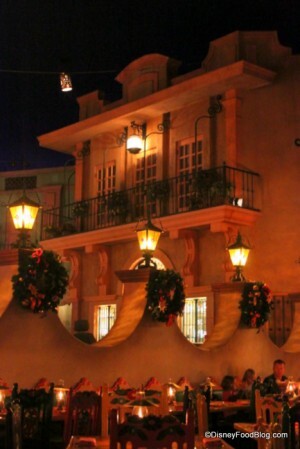 Unfortunately, La Hacienda de San Angel still has the trump card of Illuminations viewing at night, so San Angel Inn will likely be only lunch for me for the foreseeable future. 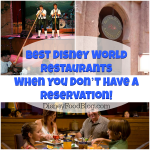 Best Disney World Restaurants When You Don’t Have A Reservation! Jenn — Hey! 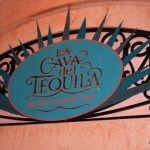 There’s nothing wrong with doubling up on La Cava and San Angel! ;-D Sounds like a great day to me! How’s marathon training going? I'm excited and hope for a water view !! 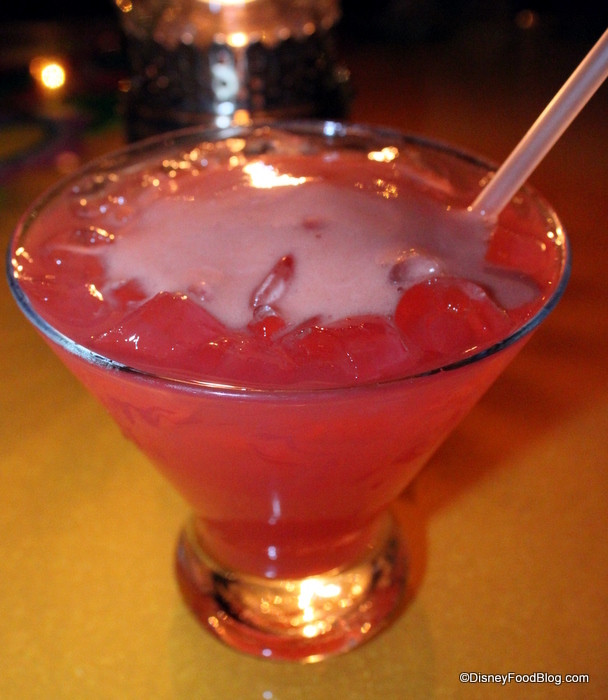 I had that Blood Orange Margarita over at the Tequila Bar. Every time I go, I mean to try a new margarita, but then I order the Blood Orange one. I do love it. With salt though. This beautiful, romantic restaurant is out of my wife’s safety zone so I have never eaten here. But I am happy to see that they seem to be improving and updating their menu. I would like to see a home run at every Disney World restaurant but as long as they keep swinging I have to give them a “well done”. AJ – we actually thought our last trip here was way better then it had ever been! I am with you and the foam – please keep it off my drink and food! Glad to see that they finally offer real tortilla chips. We’ve eaten there twice before (2002, 2005), and both times I found it just as galling as your husband did that they charged the prices that they charge and actually served customers baskets of Tostitos, with a straight face. And I hafta say that the new menu items look and sound really tasty. Almost certainly not as freakishly delectable as the tacos de lengua, tacos de birria, tacos de cabeza, and tortas that I compulsively and obsessively scarf up at my local hole-in-the-wall Mexican joint, but tasty-sounding nonetheless. One minor quibble, though: Why is it that the Tex-Mex places can’t seem to get the super-simple, hyper-delicious dish known as chilaquiles right? It’s traditionally, and deliciously, served with eggs. What’s so hard about eggs? We ate here earlier in December and were also pleasantly surprised. We thought the guacomole was great- and both my husband and I are from southern Arizona, so we know good guac! Our entrees were good- we’ve had better, but expected worse. We will make a return trip on a future vacation! 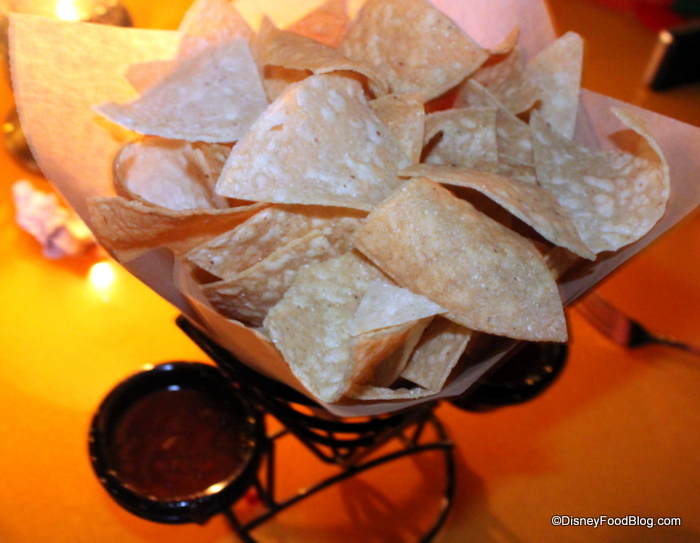 We have not been to San Angel Inn in several years, and it’s all because the chips were Tostitos! I was very disappointed that the chips were not more authentic. Good to know they’ve switched to better chips. We’ll have to try it again when we go back next year. I’m glad to hear there’s some hope for this restaurant. We ate there on our honeymoon in 1999 and have not been back since. We are native Texans and, while the atmosphere was wonderful, it couldn’t make up for the food. I think that many go to SAI expecting a version of Mexican foof that they are familiar with… i.e., more of a Tex-Mex Mexican. I’ve always equated SAI with food I’ve eaten in Mexico City than that found north of the border. Case in point: queso fresco *is* a crumbled white cheese; queso fundido is the melted stuff and is served fondue-like. I really like SAI for what it is. Just like our cuisine here in the US, Mexican food is regional. A biscuit prepared in Maine is different from one prepared in Alabama. If you’ve from Alabama, you might not like the one from Maine. I think that many SAI detractors are looking for that version of their favorites that they are most familiar with, and they just won’t find it there. As for Paradiso 37… it’s great for drinks and apps, but I wouldn’t ever recommend eating there. But that’s another story! The menu has changed a bit since we ate there in late April. The sirloin dish looks a lot better and less spicy than the one I had back then. I definitely agree on the desserts — stick to the margaritas, apps and entrees here, then have another marg for dessert! We ate there in June and were pleasantly surprised.. I asked our waiter what was “authentic” and he steered me into the right direction.. I don’t remember what I had, but it was GOOD. But, without “research” purposes, I still have too many other restaurants to try for myself! I ate there back in October and was presently surprised. It’s always been one of my “guilty pleasures.” I love the place but I’m well aware that there is better food elsewhere in World Showcase. They are definitely going through some menu revisions, and I think they will continue to do so as they try to differentiate themselves from La Hacienda. I had a mole chicken that wasn’t on the menu we saw posted at various places online and isn’t on the one you are showing. It was ok. The sauce was weak, and that’s the whole reason to buy a mole. I also had the Soupa Azteca which was interesting. The ingredients were separated in a bowl and they poured the broth over it. I mixed it myself. For that reason the flavors were not well combined nor did they have time to blend well together. Just ate there last week. 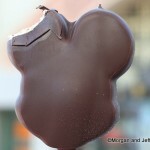 Me and my wife used the Disney Dining plan and so we got entrees and dessert. I ordered the Pollo a las Rajjas. It was very good. My wife ordered fish and I liked it as well, she didn’t. She ordered flan, her piece was bigger than what yours looks like. She really enjoyed it but she is also a flan fan. I ordered the white chocolate mousse (sp.) I had that the first time I ate there and loved it so I got it again. It didn’t disappoint. I think many Americans have differing views on how Mexican food should taste. Most would be surprised at what they serve here cause it’s not beef burritos and yellow chili con queso. I do have to comment on the queso concern. Queso Fresco means fresh cheese in spanish (my wife told me anyways) so it shouldn’t surprise anyone that its not melted yellow cheese or a cheese sauce. Overall this is a great restaurant out of 2 visits it has been amazing. The food was absolutely terrible. They use too much garlic, and the prices are sky-high. The service was slow, and unattentive. We did not enjoy the meal at all. Overall, a very bad experience. DON’T GO THERE. A waste of money. We enjoyed the meal and the experience. HOWEVER: The “corn chips,” and the “tostadas” that were served through out our luncheon, were not, in my opinion authentic: Because; there was not even a hint or/of a taste of “slacked lime” (a process used in making dried corn kernels into “harina” or corn flour that is used in/for making tortillas. 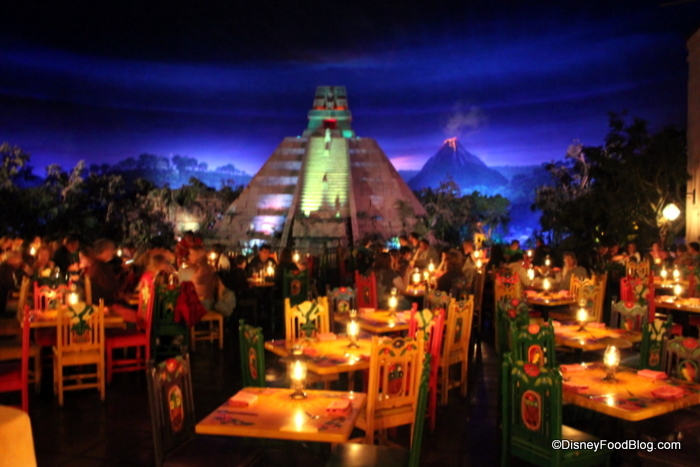 Aside from what I feel is a grave injustice to an authentic tasting corn chip, we enjoyed our experience at Epcot, at the Mexican Pavillion and at the San Angel Inn. 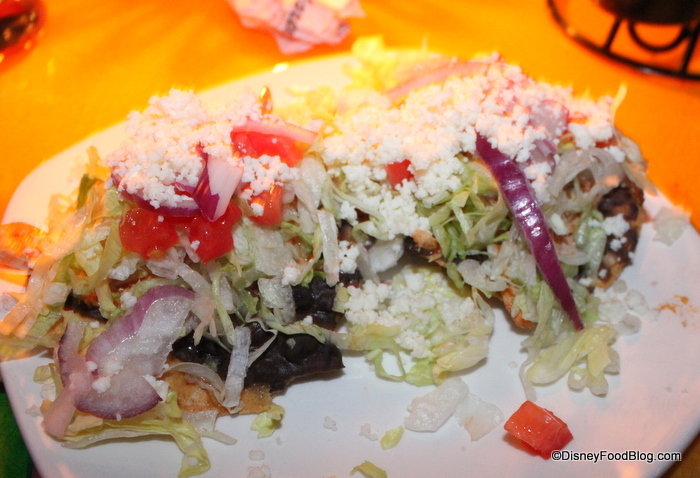 I am writing my review because I am shocked at the horrible “salsa” I had at San Angel Inn. The Marg’s were great, but with no GOOD chips and salsa they were hard to enjoy fully.